The Kite Shield first made its appearance during the 10th century. The Kite Shield was the logical evolution from the round shield carried by the Saxons. The round shield was adequate to protect one side of the warriors body, but was inefficient to cover the lower half of the body or protect from projectile weapons. The Kite Shield became popular among Norman warriors due to its length and design. 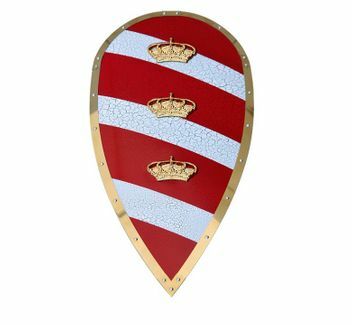 The Kite Shield could effectively protect the lower part of the warriors body, as well as offering much improved protection against projectile weapons. The Kite Shield experienced wide spread use for 200 years, but was finally retired due to improvements in armor. The Kite Shield features a handle and chain to easily hang the shield.